THE DUTIES in respect of PROBATES OF WILLS and LETTERS OF ADMINISTRATION in England, and Ireland; of Inventories of the Personal or Moveable Estates of Persons decased in Scotland; of LEGACIES and RESIDUES of such Estates in any part of the United Kingdom; and of Successions to such Estates in cases of Intestacy. 1.-In cases where a Will is left. PROBATE OF A WILL, and LETTERS OF ADMINISTRATION, WITH A WILL ANNEXED, to be granted in England or Ireland. INVENTORY to be exhibited and recorded in any Commissary Court in Scotland, of the Estate and Effects of any person deceased, who shall have left ANY WILL, TESTAMENT OR TESTAMENTARY DISPOSITION of his or her personal or moveable Estate and Effects, or any part thereof. 2.-In cases where no Will is left. LETTERS OF ADMINISTRATION, WITHOUT A WILL ANNEXED, to be granted in England or Ireland. INVENTORY to be exhibited and recorded in any Commissary Court in Scotland, of the Estate and Effects of any person deceased, who shall have died WITHOUT LEAVING ANY WILL, TESTAMENT OR TESTAMENTARY DISPOSITION of his or her personal or moveable Estate or Effects, or any part thereof. Probate of Will, Letters of Administration, and Inventory of the Effects of any common Seaman, Marine or Soldier, who shall be slain or die in the service of His Majesty, His heirs or successors. Probate of a Will or Letters of Administration of any person who shall have died, entitled to any sum of money deposited in any Savings Bank, and whose whole estate shall be under the value of 50£. Additional Inventory to be exhibited and recorded in any Commissary Court in Scotland, where the same shall not be liable to a Duty of greater amount than the Duty already paid upon any former Inventory exhibited and recorded of the estate and effects of the same person. For every Legacy, specific or pecuniary, or of any other description, of the amount or value of 20£. 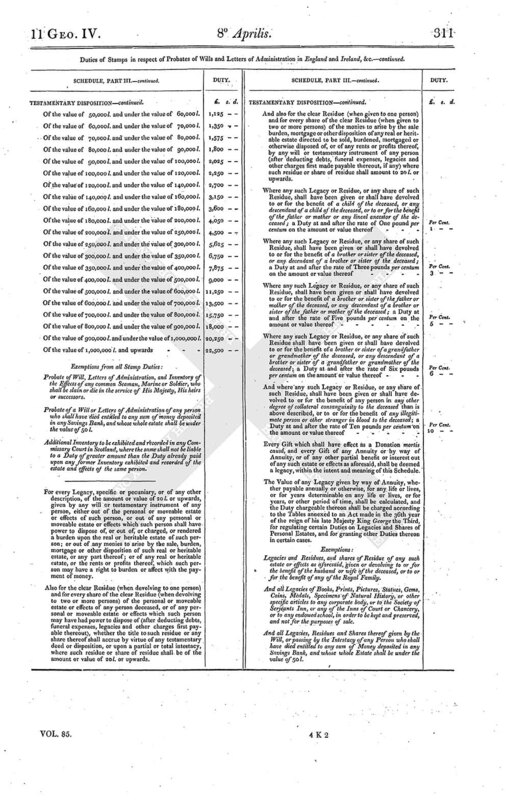 or upwards, given by any will or testamentary instrument of any person, either out of the personal or moveable estate or effects of such person, or out of any personal or moveable estate or effects which such person shall have power to dispose of, or out of, or charged, or rendered a burden upon the real or heritable estate of such person; or out of any monies to arise by the sale, burden, mortgage or other disposition of such real or heritable estate, or any part thereof; or of any real or heritable estate, or the rents or profits thereof, which such person may have a right to burden or affect with the payment of money. Also for the clear Residue (when devolving to one person) and for every share of the clear Residue (when devolving to two or more persons) of the personal or moveable estate or effects of any person deceased, or of any personal or moveable estate or effects which such person may have had power to dispose of (after deducting debts, funeral expenses, legacies and other charges first payable thereout), whether the title to such residue or any share thereof shall accrue by virtue of any testamentary deed or disposition, or upon a partial or total intestacy, where such residue or share of residue shall be of the amount or value of 20£. or upwards. And also for the clear Residue (when given to one person) and for every share of the clear Residue (when given to two or more persons) of the monies to arise by the sale burden, mortgage or other disposition of any real or heritable estate directed to be sold, burdened, mortgaged or otherwise disposed of, or of any rents or profits thereof, by any will or testamentary instrument of any person (after deducting debts, funeral expenses, legacies and other charges first made payable thereout, if any) where such residue or share of residue shall amount to 20£. or upwards. 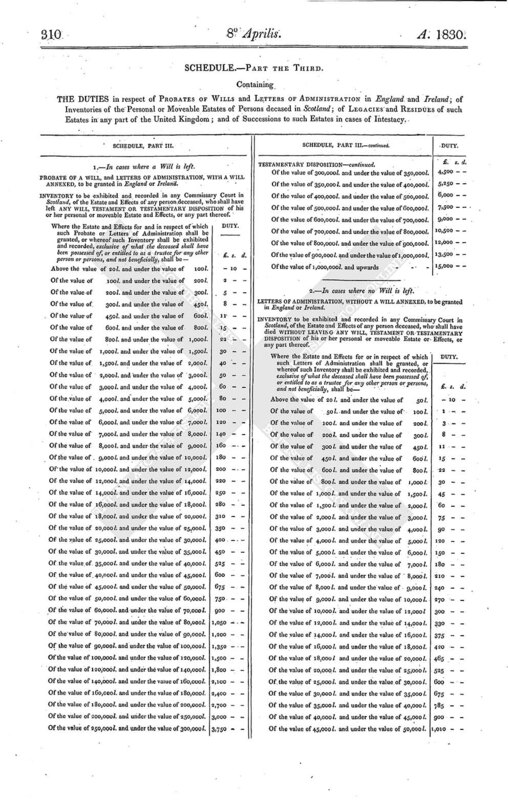 Where any such Legacy or Residue, or any share of such Residue, shall have been given or shall have devolved to or for the benefit of a child of the deceased, or any descendant of a child of the deceased, or to or for the benefit of the father or mother or any lineal ancestor of the deceased; a Duty at and after the rate of One pound per centum on the amount or value thereof Per Cent. Where any such Legacy or Residue, or any share of such Residue, shall have been given or shall have devolved to or for the benefit of a brother or sister of the deceased, or any decendant of a brother or sister of the deceased; a Duty at and after the rate of Three pounds per centum on the amount or value thereof Per Cent. Where any such Legacy or Residue, or any share of such Residue, shall have been given or shall have devolved to or for the benefit of a brother or sister of the father or mother of the deceased, or any descendant of a brother or sister of the father or mother of the deceased; a Duty at and after the rate of Five pounds per centum on the amount of value thereof Per Cent. Where any such Legacy or Residue, or any share of such Residue shall have been given or shall have devolved to or for the benefit of a brother or sister of a grandfather or grandmother of the deceased, or any descendant of a brother or sister of a grandfather or grandmother of the deceased; a Duty at and after the rate of Six pounds per centum on the amount or value thereof Per Cent. And where any such Legacy or Residue, or any share of such Residue, shall have been given or shall have devolved to or for the benefit of any person in any other degree of collateral consanguinity to the deceased than is above described, or to or for the benefit of any illegitimate person or other stranger in blood to the deceased; a Duty at and after the rate of Ten pounds per centum on the amount or value thereof Per Cent. Every Gift which shall have effect as a Donation mortis causâ, and every Gift of any Annuity or by way of Annuity, or of any other partial benefit or interest out of any such estate or effects as aforesaid, shall be deemed a legacy, within the intent and meaning of this Schedule. The Value of any Legacy given by way of Annuity, whether payable annually or otherwise, for any life or lives, or for years determinable on any life or lives, or for years, or other period of time, shall be calculated, and the Duty chargeable thereon shall be charged according to the Tables annexed to an Act made in the 36th year of the reign of his late Majesty King George the Third, for regulating certain Duties on Legacies and Shares of Personal Estates, and for granting other Duties thereon in certain cases. Legacies and Residues, and shares of Residue of any such estate or effects as aforesaid, given or devolving to or for the benefit of the husband or wife of the deceased, or to or for the benefit of any of the Royal Family. And all Legacies of Books, Prints, Pictures, Statues, Gems, Coins, Medals, Specimens of Natural History, or other specific articles to any corporate body, or to the Society of Serjeants Inn, or any of the Inns of Court or Chancery, or to any endowed school, in order to be kept and preserved, and not for the purposes of sale. And all Legacies, Residues and Shares thereof given by the Will, or passing by the Intestacy of any Person who shall have died entitled to any sum of Money deposited in any Savings Bank, and whose whole Estate shall be under the value of 50£.